If you want a hardware mixer as part of your DJ controller, look elsewhere, but if you’re purely looking for a versatile, well built and fully featured four-channel software controller – especially if you want to use it with a tablet, and you need four channels – this is a great choice. It looks and feels suitably professional. 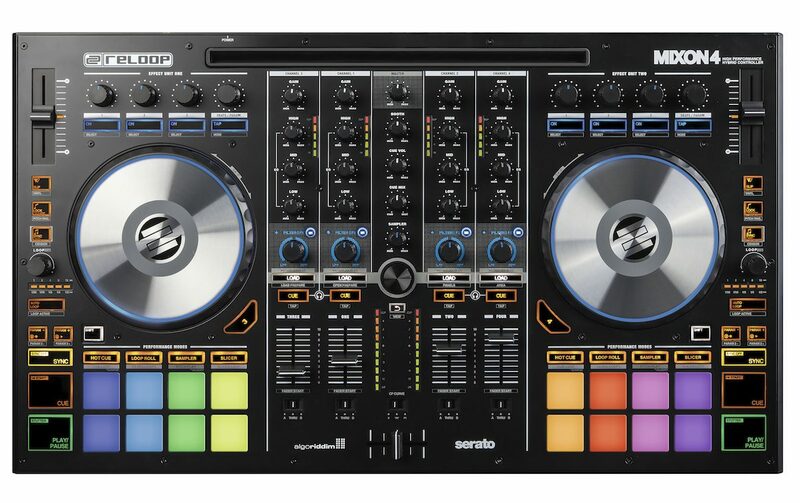 It’s big (as in Pioneer DJ DDJ-RX or Denon DJ MC7000 big), it has bolted down pots and bolted down metal faceplate, huge RGB pads, a loose crossfader, decent resistance on the up faders, and Reloop’s customarily excellent low profile jogs. The initial appearance is let down only by rather short pitch faders, although Reloop points out that they are14-bit high resolution nonetheless. Unlike the other controllers just mentioned, though, it isn’t a standalone mixer, and a cursory glance around the back and front of the unit confirms that there isn’t even a single Aux input apart from the microphone. This is strictly a software controller. A cursory glance at the back of the unit shows no external inputs at all: Yup, this is 100% a software controller. That said, it certainly doesn’t skimp on the software it works with. You can use Algoriddim’s djay Pro app (not supplied) with macOS, iOS or Android via their respective app stores (not supplied), or Serato DJ via a download from the Serato site (the controller is Serato enabled, so no purchase necessary). Leads are provided for plugging all compatible equipment into the unit; standard USB for Mac/PC, USB plus Android cable for Android devices, and a dedicated Lightning lead for iOS. It’s worth noting that if you want to use Spotify with djay Pro or Pulselocker with Serato DJ (these being the two streaming platforms available to you), again, subscriptions will be required; Pulselocker has a month-long trial with Serato DJ at the time of writing, and all Mixon 4 owners get a seven-day free trial of Spotify Premium, the version of Spotify you need to use it here. Bear in mind that to use the advertised Pitch Play and Flip functions of Serato (more on these later), again, a purchase is required, as you’ll need to buy the Pitch ‘N Time and Serato Flip add-ons in addition to to the initial software purchase. OK – once you’ve got your software installed, it’s always a good idea to check the firmware is up to date (latest firmware is available from Reloop’s product page on the company’s site), but from there on in it’s plug and play plain sailing with djay Pro and Serato DJ, as is generally the case with modern DJ controllers. Finally, Reloop says that the controller works with Traktor Pro 2 and Virtual DJ 8 as well. 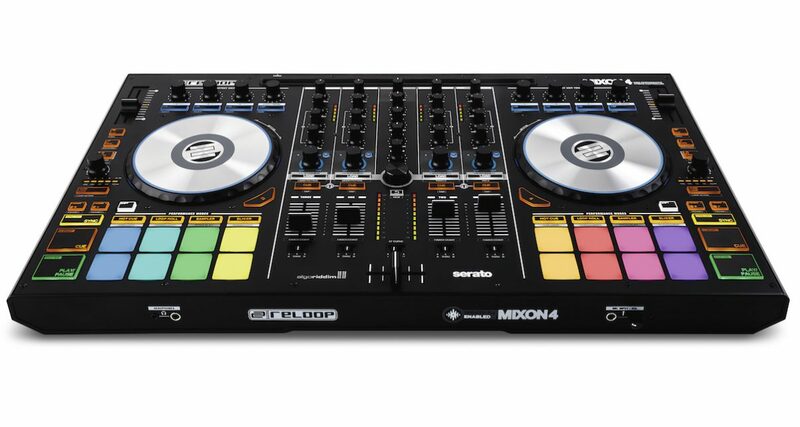 There is a Traktor Pro 2 mapping on the Reloop website that you’ll need to install and get working under your own steam, but Virtual DJ should by the time you read this have a mapping built in to use with this controller. It’s fully featured, with a few aces up its sleeve, notably the “macro FX” (ie the filter plus FX single-knob controls) and the LED system for loop roll. To test the controller, we chose to major on using djay Pro running on an iPad Pro, as this is definitely the most unique user scenario offered by the Mixon 4, being the only four channel controller to work with Algoriddim’s flagship platform. That said, we briefly plugged in a MacBook running Serato, and can confirm that Pitch Play words as advertised with Pitch ‘N Time, and all the Serato features you’d expect on a pro controller (slip, Flip, slicer, loop roll and so on) are present and correct – no surprises, and great to play on. We’ll try and keep this about the controller not the software, but how djay Pro has moved on! Four decks, ultra smooth waveforms, really slick library integration… if only you could play Apple Music files from iTunes it’d be near damned perfect (you need to own the music you play, not “rent” it from Apple Music – that kind of function only works with Spotify, which is a real shame). Anyway, suffice to say the software is mighty impressive. OK, so here’s the good stuff: The jogs are excellent, the performance pads too (big, bright, making good use of colour). The crossfader has curve options, channel assigns, and is nice and loose; the line faders have a decent resistance. The knobs generally are good; they’re plastic, not rubberised, but they feel OK, and the library knob is big and weighted, as is Reloop’s preference. The loop encoder has a light system to show you how many beats or fractions of a beat the loop roll will be for, which works well. Some may not like the hard plastic play/pause and cue buttons, but that’s just personal preference really. As I said earlier, I didn’t like the short pitch faders, as they feel cheap on a controller of this standard, although they seem accurate enough in use. The biggest omission from a hardware point of view is no external inputs, except a single mic channel with 1/4″ and 1/8″ jack inputs but no EQ, and just a solitary volume control. There’s not even an Aux input for a backup solution in case your computer or iPad fails. So just be aware if you’re buying this that it is very much a software controller through and through; those needing a bit more flexibility will have to look elsewhere. Apart from that, though, it really is pretty well featured: It has XLR and RCA master outs, TRS booth outs, cool “macro FX” where you can assign an effect to the one-knob filter and have it control both, key sync as well as beat sync, and individual channel VUs as well as the master VU. Big deck switch buttons and colour-coded LED rings on the jogwheels complete an impressive feature list. While some may not like the hard plastic play/pause and cue buttons, they work fine – and I don’t think anyone could fail to fall in love with the wonderful 3x3cm LED lit performance pads. If you’re looking for the ultimate iPad DJ controller, the Mixon 4 hits the spot. Four channels, room for the iPad pro, tight integration with djay Pro software – look no further. 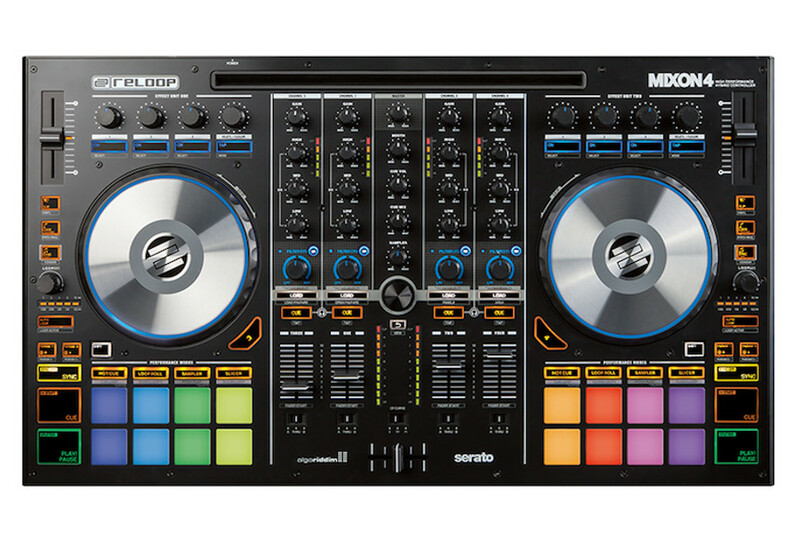 At this price point it is also a very good value pro Serato controller, if you can live without an Aux input, or a properly featured mic channel. It’s well built, and nicely sized, like the aforementioned Pioneer DJ and Denon DJ units. Aces up its sleeve include the macro FX and the LED feedback on the loop encoder, plus Pitch Play in Serato on the pads, something only seen on the Denon DJ MCX8000 to date. And the price is good too, although you should factor in buying whatever software you want to use. if you want a hardware mixer as part of your pro DJ controller, look elsewhere, buy if you’re purely looking for a versatile, well built and fully featured four-channel software controller, especially if you want to use it with a tablet, and you need four channels, this is close to perfect.